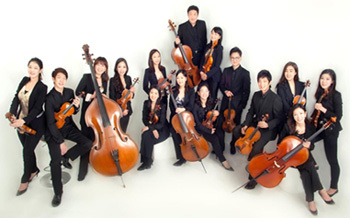 Joy of Strings, the leading chamber ensemble of Korea, was founded by violinist and professor (Korea National University of Arts) Sung-Ju Lee in 1997. The group is loved by music fans all over the world for its profound music and passionate stages. Joy of Strings is famous for not putting limits on its performing stages. The group not only performs in classical music concert halls, it performs in all sorts of venues including outdoors. Joy of Strings even performed in the traditional Korean palace located in Suwon. For the "Outreach concert project" hosted by the Korea Mecenat Association, the group plays in schools and outside of concert halls. Joy of Strings is contributing to the expansion of the classical music base in Korea through television appearances and international music festival participations. The group performed in programs such as "EBS Space Gong Gahm" and KBS "Classic Odyssey". The ensemble held a film music concert, performing original soundtracks of the popular Korean film "Marathon", and participated as Korea's representative ensemble at the "Busan Maru International Music Festival". Joy of Strings gained recognition through its debut album "Joy of Strings Classical Modernity (2006)" and its 10th Anniversary album "Vivaldi Four Seasons". In 2011, the ensemble received the Culture and Arts Special Prize from The Women's News, and in 2013 it was the first Asian group to be invited to perform at the Haydn Festspiel. The group toured Europe the same year, making both "Joy of Strings in Praha" and "The 120th Anniversary Concert of Korea-Austria Diplomatic Relations Establishment" which turned out to be huge successes. In 2014, the group was invited by Belgium's Sorodha Foundation to perform at its 200th Anniversary Concert in Belgium. The Ensemble also held a concert at the Korean Cultural Center in Brussels, Belgium. The ensemble continues to draw people's attention with its impeccable skills and music. The group will also continue to take the lead in promoting classical music to Korean audiences through its original projects.